It has not yet been possible to secure one of the large Danish ferries for the posterity. But as time passes, new opportunities arise! Despite hard-hearted enthusiasm, the DSB-ferry KONG FREDERIK IX ended in 2004 on a beach in India. It happened after years of vain struggle to preserve the 50-year-old ferry as a physical testimony of the Danish ferry history that has been crucial to Denmark’s infrastructural cohesion and development through the twentieth century. Right now, the course from the start of the millennium unfortunately appears to repeat itself with the two-year-older Great Belt-ferry BROEN. Even the involvement of museum professionals, this time, could ensure the preservation of this fellow-representative from the fifties ferry infrastructure between Denmark’s regions; From the decade that led up to the years where private car-ownership exploded and forever changed the Danish transport pattern. BROEN – with its long-standing function as a floating discotheque, why a large portions of the original interior is retained inside black-painted plasterboard – is not yet ultimately laid in the grave. But, unfortunately, alot indicates that it also ends as a ferry conservation project that fall through. What is essential for a different outcome next time, is a government involvement. An old ferry should in some exceptional cases be regarded as a cultural heritage in relation to the country’s transport and industrial history. Therefore, ferry preservation should be something that can be included in the Finance Act, when the opportunity arises next time. For even with the 1950s, as a ferry-conserving decade, where the chances are wasted, time passes. A new decade will – for a new generation – suddenly be a long time ago, but within personal memory. For Danes, who are now 60 years old, the 1960s gains a strong remembrance. This specific decade is also something special regarding ferry history. Perhaps even the most important of all decades in that regard, with a myriad of new Danish car ferries. Some of them were from the major Danish newbuilding yards to the many new private ferry companies that were established those ten years. Some of the Danish ferries from the sixties still exist in southerly waters. Therefore, there is also a theoretical chance to retrieve one and preserve it as a museum. But the question is, how valuable these ferries in fact are today after more than forty years of service and refurbishment in the ownership of several different operators. Above all, the experience of previous preservation attempts shows that there is no room for an unrealistic outset. Instead, let’s take advantage of the fact that time pass on, and instead look at one of my own generation’s definitive decades, the 1970s. In a ferry-historical perspective, operational and fully-active large ferries in Denmark have never had as many years on their keels as they have today. The average age is now about a quarter of a century, which means that there are fully active and fully classed high jumpers among them. One of them is Molslinjen’s newly acquired Bornholm-ferry POVL ANKER, which was delivered from Aalborg Shipyard in 1978. But is it worthy a conservation – and what makes a big car and passenger ferry worth preserving? To my best knowledge, there are no officially defined guidelines for this in Denmark, as the state has not previously shown an interest in the area! A guideline suggestion could be: (1) That a ferry can be considered worth preserving if it is the only remaining representative of its kind. (2) If it is in a predominantly intact condition, it should not need to be returned into its original appearance during major and costly rebuilding. (3) If it has been crucial for the country’s infrastructure. (4) If it has had a remembrance potential for a major part of the country’s population. (5) Furthermore, the ferry should represent Danish industrial history as being built by a Danish shipyard. (6) As well as being in an interior-wise predominantly intact condition, which can contribute an authentic time warp of Danish design and shipbuilding in a given historical period. POVL ANKER meets these six suggested criteria. While the sister ship JENS KOFOED was rebuilt by its current owners in 2005, POVL ANKER, on the other hand, is in most of its passenger and crew accommodation intact with original furniture and original decor and colours. 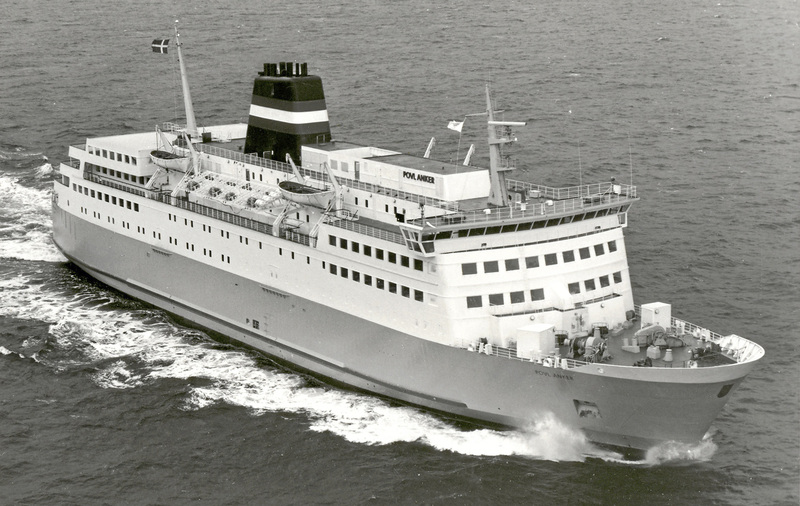 The ferry was along with the sister ship from the late seventies to 2005 lifeline for Bornholm’s contact with the mainland and furthermore in memory of a very large proportion of the present population, regardless of where you grew up in Denmark, as the school camp-ferry to Bornholm. POVL ANKER represents the best in state-contracted shipbuilding from one of the country’s most competent ferry yards in the 1970s, where passenger ship design was taken as seriously as architecture on land and industrial design in general. POVL ANKER is today a unique time warp of modern Danish design of very high quality, which was also found on board ferries such as DANA REGINA, DANA ANGLIA, PEDER PAARS, NIELS KLIM, on one of the current HH-ferries and on some of Scandlines’ current Rødby-Puttgarden-ferries. Those current ferries all resamples traces, but POVL ANKER is the only remaining ferry where this design language still can be experienced intact. However, the phasing out of POVL ANKER is not imminent. The ferry is particularly popular in Bornholm, where Molslinjen wisely chose to ensure its continued operation after the company takes over operations from Danske Færger from the autumn. At the same time, POVL ANKER is also a major asset in the German tourist market, which feeds the solely commercial route between Sassnitz and Rønne. But just the fact that POVL ANKER might have another ten years in commercial operation, creates the possibility of being pro-active in terms of a preservation of the ferry. The first seed for conservation efforts must be set now – and Molslinjen must therefore be sensitive in the ongoing maintenance and renovation of the ferry under their ownership. In ten years POVL ANKER is seven years older than KONG FREDERIK IX was, when the effort to preserve that ferry, was initiated. So, yes, time goes by, but it is still not too late to preserve central parts of the Danish ferry culture between the regions. But shall the industrial history with the big Danish newbuilding yards be a part of the story, then there are only a few chances left. POVL ANKER was yard number 221 from Aalborg Skibsværft and was handed over to the state-owned company Bornholmstrafikken in December 1978. The sister ship JENS KOFOED followed in spring 1979. The two sister ferries are designed in a collaboration between Aalborg Skibsværft, the world renowned Danish naval architect company Knud E. Hansen, DSB’s head of design, back then, Jens Nielsen and the Danish architect Niels Kryger. A large part of the furniture, which is still on board POVL ANKER, consists of cafeteria and lounge chairs designed by Danish architect Kay Kørbing, regarded as the most influential Danish designer in the ferry area, with a long reference list including DSB-Rederi, DFDS and Tor Line. The project of building the two ferries was by Bornholmstrafikken considered as a prestige project, which would set a new standard for state-owned ferries. Something which was realized in the following years state-contracted newbuilding project with three large IC ferries for the Great Belt – and subsequently with PEDER PAARS and NIELS KLIM. This new high standard can be traced right up to Scandlines’ two current Danish flagged ferries from the late nineties on the Rødby – Puttgarden route, PRINSESSE BENEDIKTE and PRINS RICHARD, which, after several facelifts today, appear to be significantly less original than the 20-year older POVL ANKER.